Banish 10 cards from the top of your Deck, face-down; draw 2 cards. You can only activate 1 “Pot of Desires” per turn. Pot of Desires is a young Throwback choice for our Thursday pick, but a good one none the less. Banishing 10 cards from the main deck off the top is a steep cost, especially if you get hit with Ash Blossom or another negation. The draw two can net you something you need, but the threat of banishing cards you may need that you only run in single copies is too much of a risk in my opinion. It was a big staple in the 60-card variant decks that played three alongside That Grass Looks Greener before it was banned. Now that Pot of Extravagance is in the game, Pot of Desires has some harsh competition for what should be played in the Main Deck. Not so much of a throw, more of a toss or lob back Thursday. Pot of Desires is a Normal Spell that costs 10 cards from your deck to be banished face-down. Then if it’s not negated, you can draw 2 cards. You can only activate one per turn which makes sense because you don’t want to give up half your deck or more. Also, drawing 6 cards would be ridiculous. I remember reviewing this the first time and thinking it would be banned like all the other good draw cards. I miss Pot of Avarice. For now, this is a toss up with yesterday’s pot. I’m also fairly certain there will be new pots to contend for that Draw 2 spot. Run this if you run multiples of cards you need. Pot of Desires isn’t worth it in something like Sky Striker because there is only one Hornet Drones now. An older entry from “What Will Players do to Draw 2 Cards?” is here for Throwback Thursday and while I could of went with Pot of Greed, do you really need us to tell you how good “Draw 2 Cards” without restrictions at all is? 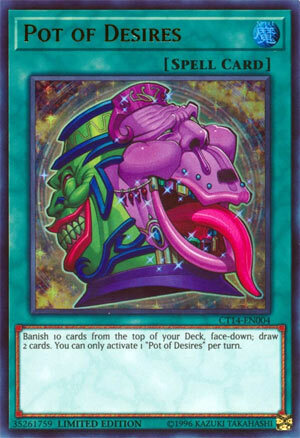 Instead we look at a card that tries its best to balance out Pot of Greed, Pot of Desires. Pot of Desires is a Normal Spell that banishes 10 cards from the top of your deck face-down to draw 2 cards. Now on paper, that cost seems very steep, and it is. That’s typically 25% of your deck gone and those cards could of been useful, but in return you get 2 other cards from your deck. This is most useful in decks without cards they highly rely on, especially one-ofs, because you don’t want to banish your most important cards. You’d like this in decks where you don’t have cards that are overly important to you winning the duel, or at least you have them at three in your deck since it is next to impossible to banish them all really. Now a common complaint about this card might be banishing what you needed to draw, but to be fair, if you are activating this card to get to it and you ended up banishing it, it isn’t like you had the card to begin with and now you got two new cards to maybe help you out instead of that one specific card. Desires is a hard once per turn, though I doubt you want to banish 20 cards considering the banish 10 is a cost. Desires is once again useful in decks with cards they don’t overly rely on or at least run them in multiples, so play three of them in those decks, and don’t be afraid to run more than 40 cards just so you have more to banish, just don’t throw in anything, still throw in good cards, maybe even Upstart Goblin just cause it’s a free card. Art: 3.5/5 I miss Pot of Avarice now, I hope it comes back. Throwback Thursday brings us to Pot of Desires, as I semi-alluded to yesterday. This has the removal aspect to Draw like yesterday, but differently, and at a much bigger cost. Removing 10 cards from your Deck (face-down) lets your Draw two cards. In that aspect alone, Extravagance is better, as you can Draw 2 by only removing 6. But you aren’t prevented from further Draw after, if you use Desires. I wasn’t exactly sold on Desires either time then (yea, I made both that time, go grandpa Alex) and I’m still not big on this here, especially after yesterday. This is, as yesterday was, a card you can’t just throw in your Deck, use in a pinch to Draw, and hope for the best. It has a place in various Decks, and if it’s a for the win move, I’m all for it, but with a biggest cost alone (10 cards) it’s harder to use than Desires. Or, more accurately, I feel you’ll be able to use it less often, as the 10 card cost doesn’t fluctuate (even if here it’s from the Deck, as opposed to Extra Deck) when you have the 3 or 6 card option of removal with Desires. That can be important, even with the semi-negative non-further Draw effect attached to Desires. Use this intelligently, removal can be a big aspect of play for Psychic players, so there’s that. Advanced–3/5 Why lower than Extravagance? It’s average…some players, like Psychics, CAN use this with success, but others won’t get much or enough from it. Ironically, I feel Desires works better for you, even a Psychic player in Advanced. Traditional rating: 4.25/5 Why higher than Extravagance? The non-Draw effect after HURTS more in Traditional. Like yesterday, I do feel this card actually has power in Traditional as well, probably more so. 10 cards is a lot to lose, but it could help you win/OTK/FTK all the more faster. Bigger risk, bigger reward. Art: 3/5 Bland, very bland, even in the contrast of the sides, and too much darkness in this picture.